SOLDIERS BY NAME Allen, Thomas S.
Thomas S. Allen was born on July 26, 1825 in Andover, Allegany County, New York and later resided in Mineral Point, Wisconsin. Allen enlisted in the 2nd Wisconsin Infantry Company I on April 26, 1861. He enlisted as a Captain at the age of 35 and was mustered into service on April 27. On August 22, Allen was transferred from Co. I to field and staff. That same day, he was also promoted to Major and on August 30, he was promoted to Lieutenant Colonel. 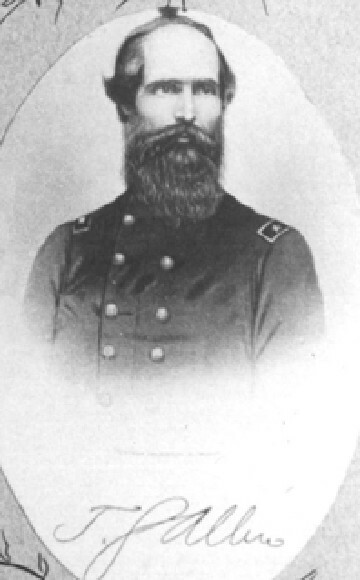 He was discharged for promotion to Colonel of the 5th Wisconsin Infantry on December 25. At Rappahannock Station, Virginia, Allen was wounded in action. On March 13, 1865, he was promoted to Brigadier General by Brevet for meritorious services during the war. He was discharged from service on June 20 and died December 12, 1905 in Oshkosh, Wisconsin.